SMALL SEBENZA 21. CPM S35VN Stonewash finish blade. Double Silver Titanium Thumb lug. Thumb notches, phosphor-bronze washers, bead blast titanium rear handle with integral side-lock. Blast Titanium front handle . Polished stainless screws, pins & pivot. Silver Titanium backspacer washer. Thonghole, bead blast titanium clip. 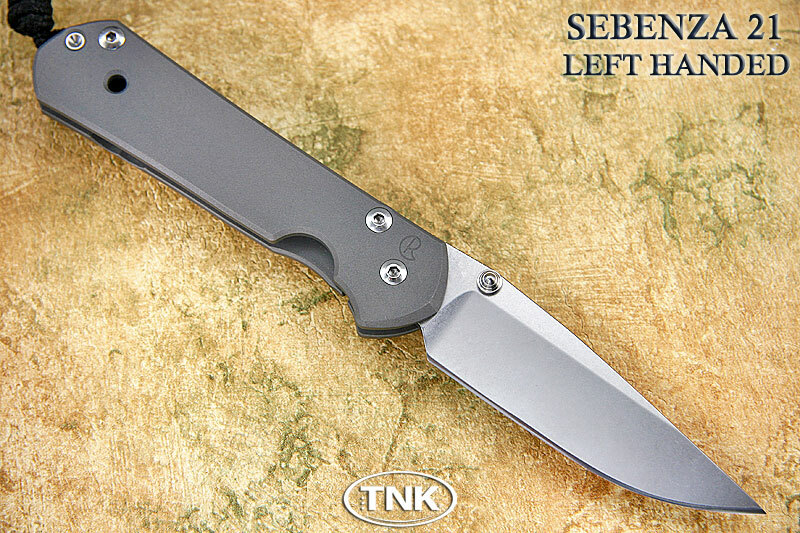 In 2008, the Regular Sebenza was discontinued and the SEBENZA 21 is now the standard Sebenza in the CRK lineup. Whether 21, Regular or Classic versions - tumbled or "stonewashed" S30V blades with bead blasted or decorated handles - to those with Damascus blades and lavish graphics, each Chris Reeve Sebenza knife is individually fitted to the closest tolerances. Available in large or small, 21, Classic (left) or Regular (right), and dedicated right or left handed. A Chris Reeve SEBENZA is guaranteed by the company for life, under proper use. Not only are you buying an award winning cutting tool, you also become a part of the Chris Reeve family.